The Melrose Trading Post has long been one of the undisputed kings of L.A.’s thrifting scene. All that hype means there’s an obscene amount of great vendors, and a lot of competition from tourists and locals. The quantity of goods can be overwhelming—we’re talking piles of stained denim and vintage band t-shirts to dig through. Shoppers with a lot of time on their hands are almost guaranteed to find something, but sometimes you need to focus in on the best sellers. Here are five under-the-radar vendors at the Melrose Flea to hit up for totally unique, reasonable finds. Purr is everything a good flea market stand should be: adorable, one-of-a-kind, and cheap as hell. The only reason I’m giving up my ultimate sundress spot is because the women who run Purr are the nicest people alive and deserve all the success in the world. Head straight to this stand for sets, skirts and dresses that are sure to garner compliments from strangers. Very Good LA are newcomers to the scene, but they already have all the makings of a flea market cornerstone. The antique collectors have a discerning eye, as is evidenced by their massive cache of film cameras. Think of their stall as a sepia-toned Ikea, full of retrochic home goods in excellent condition. Gems spotted last week include vintage skateboards, Rubix cubes, and wall art. Bonus points for a shop dog—an especially cute and cool Huskie named Scout. The 100 percent soy candle company run by two sisters is a regular at several L.A. market mainstays like Artists and Fleas, but their Melrose stand is always a well-stocked standout. The sisters are always rolling out new products—check out their new soap-based essential oils—in intoxicating scents like tropical Bora Bora and tangy Wild Grapefruit. The double-wicked large candles have 65 hours of burn time and make an excellent gift. At $18 they’re a steal—it’s not uncommon for boutique candles to be priced five times that high. Go bold and buy the musky, amber-scented Homme for a strong but unobtrusive scent. Embroidery is big in the fashion world right now, and there’s no better place to stock up on threads than The Folk Collection. Everything they carry, from dresses to blankets, are handmade in Mexico. The result? Gorgeously intricate and authentic pieces. In addition to embroidered goods, The Folk Collection also sells handwoven hats, sandals, straw bags—excellent beach day accessories. 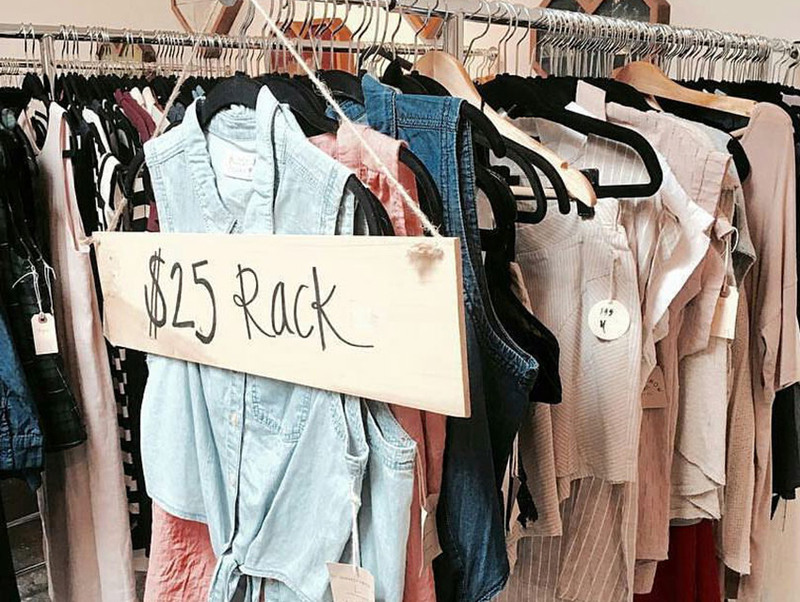 People who frequent fleas to support small businesses and stock their closet with unique pieces come here, and you should, too. The OC-based Infinite Expression Apparel specializes in limited stock lists, selling customizable, rare clothing. Trippy cats, cartoon characters, and other pop culture figures (Bernie Sanders pin, anyone?) are frequent fodder for customizing Members Only jackets, denim, and more. Dip your toe into the Infinite Expression waters by picking up a few Drake pins—or just go for it and buy a jacket. Unlike other streetwear brands, you won’t need to sell your car to pick up something rad. An Infinite Expression windbreaker only sets you back $25, making it hard not to buy out the stall.